A new Irving Shipbuilding research chair at Dalhousie University will contribute to Canada becoming a premier marine research leader in the world. The Irving Shipbuilding Chair in Marine Engineering and Autonomous Systems will create a foundation for sustainable Canadian talent and leadership in marine engineering and provide leadership in Ocean Engineering at Dalhousie University. Irving Shipbuilding is contributing $500,000 to establish and support the research chair position. Dr. Mae Seto, an associate professor in Dalhousie’s Faculty of Engineering, has been appointed the Irving Shipbuilding Chair in Marine and Engineering Autonomous Systems and work is already underway on many projects. Dr. Seto worked for 16 years as a defence scientist with Defence Research and Development Canada (DRDC). Her experience positions her well to not only undertake this highly specialized research, but also support students in her lab to follow in her footsteps. Dr. Seto and the students she supervises are working on intelligent autonomous systems, unmanned ships, shipboard intelligent launch and recovery systems, and marine robotics. Their research activity, done in conjunction with the Ocean Frontiers Institute (OFI) will support many aspects of the marine industry including, search and rescue, underwater communications and navigation, and oceanographic modeling with the aim to use that information to create economic and social value. This research area is a key to the success of OFI, which relies on the development of new and innovative technologies to measure and observe the ocean. Atlantic Canada has a rich history in ocean sensing which has long been supported through DRDC, the Canadian Navy and the Bedford Institute of Oceanography. Irving Shipbuilding is funding the chair position as part of the Value Proposition commitment under Canada’s National Shipbuilding Strategy. Through this commitment, Irving Shipbuilding will invest 0.5% of contract revenues in projects that will help create a sustainable marine industry. 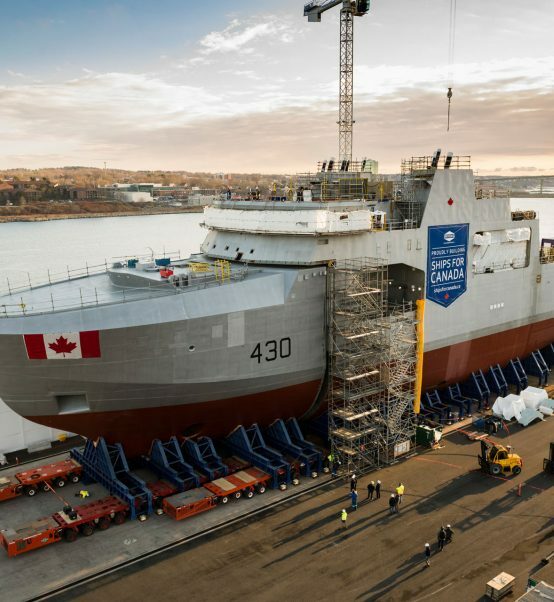 The Value Proposition commitments on the Arctic and Offshore Patrol Ships, currently under construction at the Halifax Shipyard, will provide approximately $12.5 million in funding to projects across Canada. Dr. Seto, Director of the Intelligent Systems Laboratory, with students from her lab. 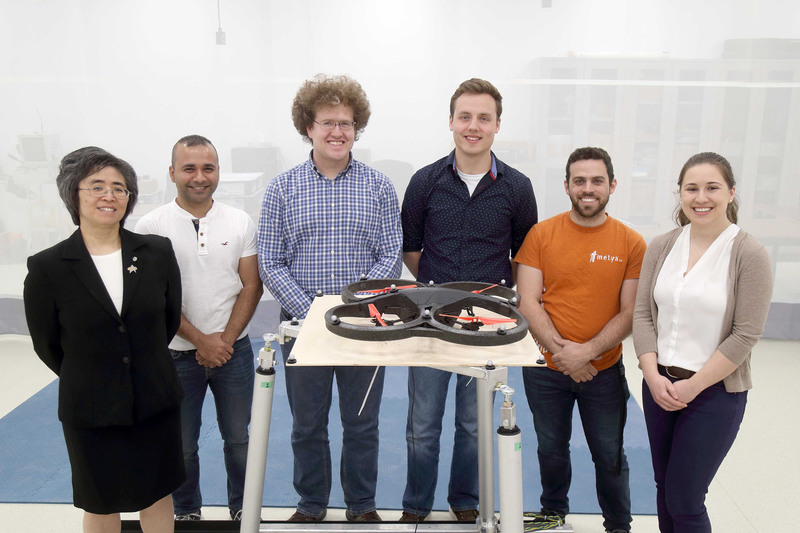 (L-R: Mae Seto, Hemang Purohit, Edward Gregson, Elijah Vautour, Jordan Ross, and Amy Deeb; missing: Kate Svendsen, Parth Pasnani, Alexander Moore, Joel Lindsay ). The unmanned aerial vehicle shown is perched on a Stewart-Gough platform after autonomously landing on it. This platform mechanically emulates the ship motions, for an input ship class, in a sea state. "I am honoured to occupy the Irving Shipbuilding Research Chair in Marine Engineering and Autonomous Systems. My collaboration with OFI provides me with an opportunity to conduct timely research in the field of marine robotics and develop state-of-the-art ocean observation systems that will give us an unprecedented view of the marine environment." Intelligent Systems Laboratory graduate students Amy Deeb and Jordan Ross test advanced methods to autonomously land quadrotors on ships in heavy seas. The structure below the quadrotor, a Stewart-Gough platform, mechanically emulates the degrees-of-freedom for a ship, of a select class, in a sea state.